З.Ы. линк на скрин моедльки,именно модельки я давал еще в первые дни открытия ОП,так что те кто не довольны,ставьте минусы. Гильдия Ascendance с реалма EU-Alonsus первой в мире 3 августа в 21:21 сделала достижение Слава рейдеру Огненных Просторов, за которое игроки получили данного маунта. Грац ребят. Зелёный феникс,это с Питомцем Зелёный слизнючёнышь. Вот ты такой зелёный становишься. На данный момент итем получить невозможно, как только вы выполните все достижения СРОП маунт появится у вас в стойлах :) не надо ждать его на почте пол часа как я. FIRST! Lol joking. This mount sounds like it is going to look sweeeeet. Very likely a drop from the Fire Hawk boss in the Firelands raid. Im going to go out on a limb here and say this is the mount. Im going to go out on a limb here and say that this is the mount. Will be the reward of the Firelands Meta-Raidachievment. Like a Fire Hawk. Only better. Who said corruption was bad? 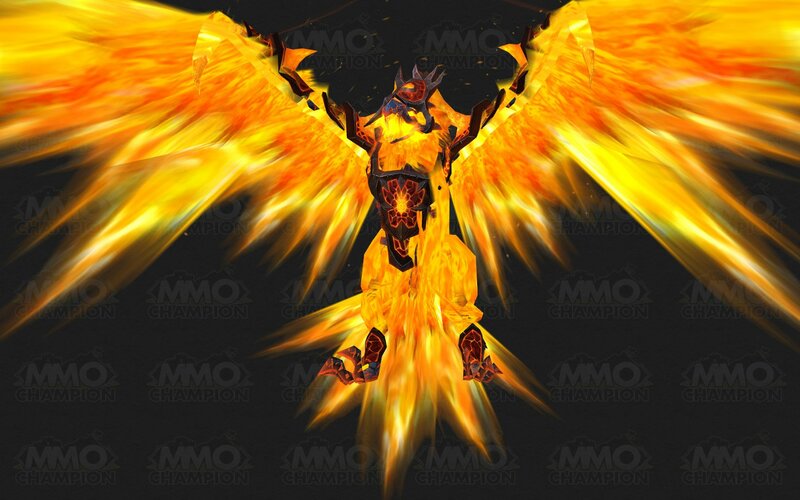 Maybe this is an alternative to those who can't get their hands on the fire hawks that will likely come with Firelands' raid meta-achievement? I guess this will be a drop from a rare hawk, most likely named Millagazor, which will spawn somewhere in the Firelands questing zone. I can't wait, it'll be awesome to ride the fire hawk! Green sounds abit more fitting, it is corrupted after all. This is most likely a reward for completing the Firelands daily quests, due to the fact the in the precursor to the quest hub, one of the dailies is to defeat the Fire Hawk Millgazor. It is unlikely it will be used in a raid. My guess is this is for the raid meta, while the Crimson Fire Hawk will probably be a raid drop... the Beryl Fire Hawk should just be similar to Drake of the West Wind and be purchased with the new currency from the daily hubs after you've unlocked the entirety of the quest area. 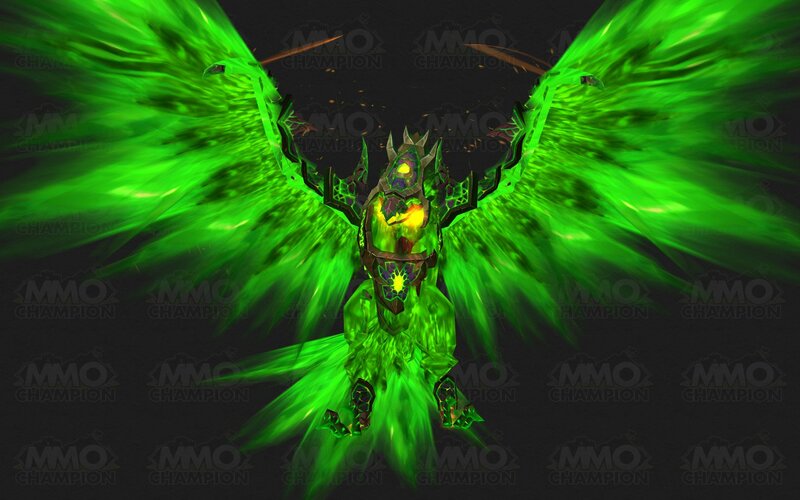 This Corrupted Fire Hawk makes the phoenix mount from Tempest Keep look like a hatchling. Beats it by a long shot! guys this is a proto drake ashes mix i knew this from the first time i saw it look how it stands and roars its proto ashes mix there yeah go! Its the reward for the new raid meta achive for patch 4.2 firelands. Same model as the Green and the Red firehawk. Currently you DO NOT have to kill rag on heroic or get the achievement for him. I will never get any of these. Edit: Come on, google "O Fortuna" before downrating....you will neither get this mount, nor brains, downraters. Make sure you are at least level 70 if you're going for this! And there is rumors of a hotfix being added for guild run mounts. The color for that mount would obviously be something different. I may actually get into raiding seriously just to have this mount. My hopes can only be so high for RNG drops, but these are guaranteed with some hard work. 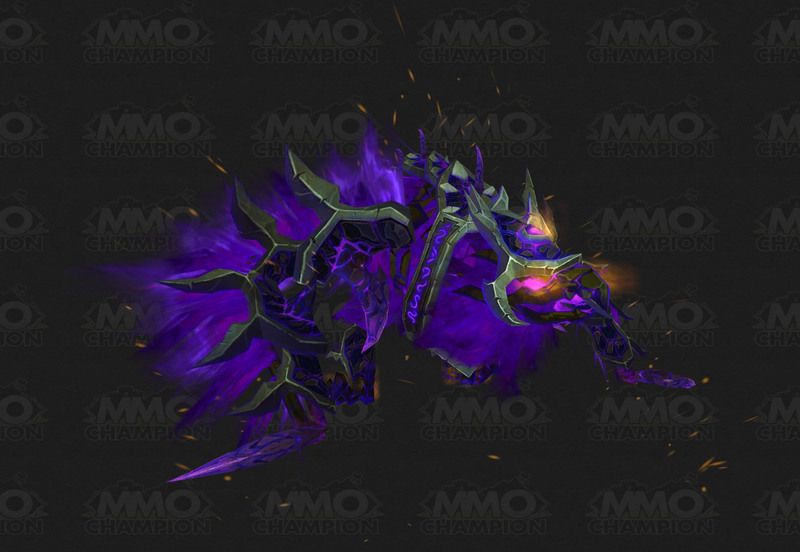 The WoW website updated the picture for this and it is indeed purple. The green one was just a bug. When the world's strongest rose to the rallying call of the Avengers of Hyjal, you stood among the very greatest of them, the best and the bravest who dared all in that maw of fire and hatred. A clutch of Millagazor's eggs has been discovered, tainted by the otherworldly vileness of the Twilight's Hammer. Rather than destroying what remains of her brood, it is my hope that champions such as you, through strength of character and force of will, can tame the ill-fated hatchlings, offering them lives as noble steeds and companions rather than doomed monstrosities. This mount is truly beautiful. Though, sadly, I don't see myself ever owning it. With all the huge nerfs even on heroic bosses, the sight of this beautiful mount will be pretty common. Must agree on this, we set this up last night with no non-heroic achievements done and we had it finished within a couple of hours, the hardest achievement was to get all our ten raiders organized to take a screenshot! Amazing looking mount. Our guild just picked up 25 of these. Once you have 6/7 Heroic FL on farm, the other achievements can be done on normal mode. The only one that gave us some trouble was Сделай "бочку"! The green one is just the red/orange one under the effect of Disgusting Oozeling. Jan Thomas 4 LIFE BRO! As Expected - Realm First @ Xavious. When you complete this or any other glory of the x raider achievement, the reward mount wont appear in your mailbox instantly like it normaly should. Reason for this is currently unknown. I needed to wait over a week until it appeared in my mailbox and i've heard similar storys from quite many other fellas that have completed any of these achievements. Hope this helps! I started my Firelands achievement run on the 13th of Jan 2013. And I just finished it a few hrs ago, on the 27th of Jul. Took a long, painful 7 months of either having fail groups, ppl rage quit or achieves done wrong so finally today I got into a winning group to finish my run. This mount is probably my 2nd fav., next to the Onyxian Drake & i'm just so elated to have finally gotten it! This last successful group I was in, we were all ilvl 520+ 90s. We burned through all the bosses rather quickly so if you can get into a group w/geared 90s only, you should have no problem finishing the criteria for this achievement. For Do a Barrel Roll!, we all stood at the side of the hill to the left as soon as the annoyingly long intro was over & just DOT-ed Alysrazor down when she was in range while the tank took care of the spawns/adds right next to us. She went down quicker than I expected. But then again, everyone was geared so it was a nuke. My last achievement needed was Only the Penitent... & for that we had 6 people, 3 on each side. Before even starting, we made macros for either /kneel or /sit. (Someone said Blood Elves sit faster than they kneel.) I did notice my hunter went down faster when I hit x (/sit) than when I did /kneel. So we hotfixed the macro to our #1 key & proceeded to finish the achievement. I def. recommend making macros for this particular 1! Saves time + people making errors. Also what helped me was if I didn't know how to do 1 of the achievements, I went onto YouTube to watch how it's done, which made it easier not to mess up cuz I knew what I was doing. Good luck all! This mount is totally worth it! It's beautiful! As now mounts are account wide you might not receive the item to learn them, but the mount will go directly in your mount journal. This was the case with me on this mount so check out your mount journal if not in the mail. Talking with my guild tonight, it sounds like "Do a Barrel Roll" achievement as part of this meta is currently bugged in 5.4.2. I would like someone to confirm or deny this if possible (eg. recently obtained this mount without "Do a Barrel Roll" step completed beforehand) Thanks! I wish Blizz corrected its wiggling head while it flys... makes it look weird and not as kool as it should be. As we all know, flying predators (such as Hawks) are supposed to keep their head still while flying in order to keep track of their prey. Please PLEASE Blizz fix this... Don't tell me it can't be done because you did it with rams.... they used to have their heads completely still when running (made them look much more badass) but now they stretch it once you start moving. what a beautiful things. this blue-violet fire, raging flame, blazing wings. true dark fire God. In my opinion, a higher honer to have than the pure blood because of how difficult it is to find 6 people for "only the penitent..." who know what they are doing as well as all the other achieves being a pain. With the pure blood, it depends on attention span and dumb luck so it cant really count towards being difficult. I finally completed this achievement today (getting 6 people to /kneel properly for Penitent is the biggest challenge), and did not receive the egg in the mail. Instead, the Corrupted Fire Hawk just appeared in my mount log. So if you complete the achieve and are wondering where your egg is, check your mount log. It seems you may not get this item in the mail any more. Использование: Учит призывать и отпускать порочного огнеястреба. Это летающее средство передвижения. "Огнеястреб Миллазор была предана Рагнаросу. Сейчас сложно сказать, сколько яиц из ее кладки были подвержены порче."